Scott Fruge (VFW), Barry Cox (VFW), Randy Helmberger (KofC), Bill Mulchay (KofC) Gus Cabarcas, community development manager at Hope For The Warriors, Frank Prigmore Wounded Heroes Benefit Concert organizer and Tony Huertas. CAMPBELL, TEXAS (Jan. 23) – The Sixth Annual Wounded Heroes Benefit Concert raised more than $20,000 to benefit Hope For The Warriors, a national nonprofit dedicated to restoring a sense of self, family and hope for veterans, service members and military families. 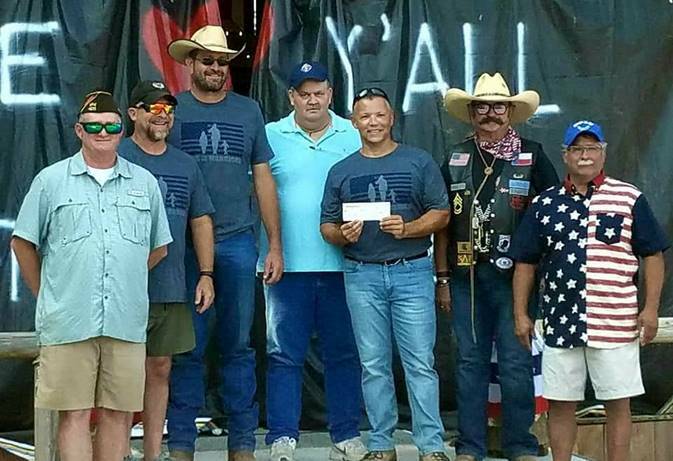 Part of the proceeds were used to provide critical assistance to 13 coastal, Texas-based military families in addition to grocery store gift cards for 56 veterans, all impacted by Hurricane Harvey. Located on the Bar-Double Horseshoe Ranch at Clancys Saloon and Stage, the two-day concert is hosted by Frank and Carron Prigmore and family and coincides with Patriot Day each year. While all active-duty military members and veterans attended for free, the annual outdoor concert series has raised more than $76,000 for Hope For The Warriors programs. Celebrating 11 years of service, Hope For The Warriors assists veterans, service members and military families with a variety of programming including transition services, clinical health and wellness, sports and recreation and community development and engagement. For more information, visit hopeforthewarriors.org or facebook.com/WoundedHeroesBenefitConcert. Founded in 2006, Hope For The Warriors is a national nonprofit dedicated to restoring a sense of self, family and hope for post 9/11 veterans, service members and military families. Since its inception, Hope For The Warriors has served more than 13,000 through a variety of support programs focused on transition services, clinical health and wellness, sports and recreation and community development and engagement. The nonprofit’s first program, A Warrior’s Wish, has granted 176 wishes to fulfill a desire for a better quality of life or support a quest for gratifying endeavors. In addition, Run For The Warriors has captured the hearts of more than 22,000 since 2010. For more information, visit hopeforthewarriors.org, Facebook or Twitter.